Steve Burton is set to join fans in a health and fitness journey. 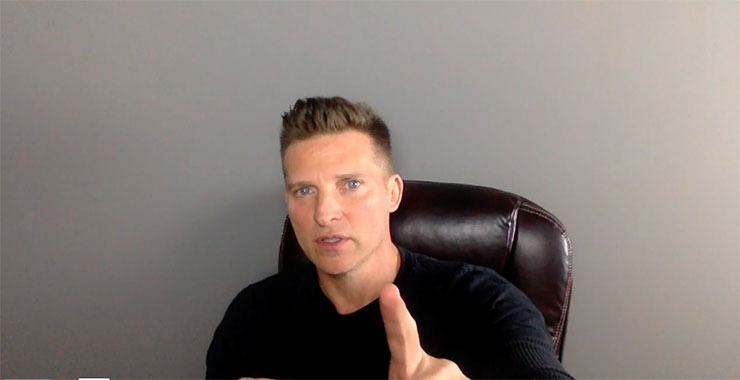 “General Hospital” and “The Young and the Restless” fans may miss seeing Steve Burton in daytime. But you can still get a little help from the soap vet in looking and feeling great. In an message to subscribers to his email list, Burton revealed that one of the many businesses he has a hand in is Burton Nutrition Company (BNC). The first product available through this new venture is a protein shake to replace or augment meals or assist in post-weight lifting recovery. “I have a huge passion for health and fitness, and I really have a passion for helping people,” Burton said in a video that accompanied his email. Scroll down to see the full video. Burton fans already know the fan fave is keen on health-related topics. His buff physique, on display during both his “General Hospital” and “The Young and the Restless” days, is proof, after all. Burton pointed out that the BNC shakes are all-natural and taste great too. There’s another another important thing Burton is offering to those who want to reach a fitness goal: help. “We’re going to start a community for support and accountability…I’m going to go through this with you guys,” Burton said. Hence, select BNC patrons will get to see a weekly webinar hosted by none other than Burton. Fitness experts cite a lack of support as a main reason people often start healthier lifestyles but have trouble following through with them. Achieving your fitness objectives isn’t about quick fixes, it’s about changing your thinking and lifestyle, Burton said. “Without our health, we have nothing,” the actor stressed. Burton Nutrition – Pre-Launch! from BURTON NUTRITION CO. on Vimeo.